Naughty Boy, Badshah and Anirudh announced for BBC Asian Network Live in London! 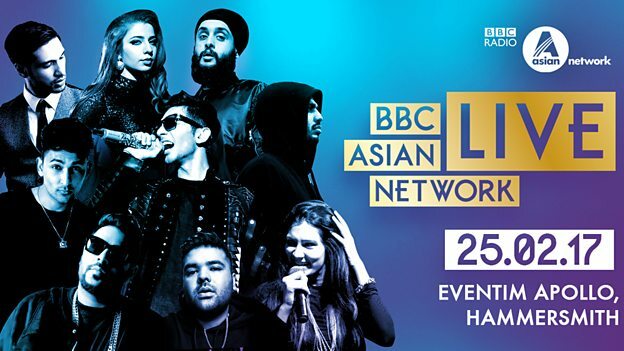 BBC Radio Asian Network today announced the line-up for Asian Network Live in London – the station’s flagship event – which is set to take place on Saturday 25 February at Eventim Apollo, Hammersmith. Asian Network recently became part of the BBC’s youth radio stations under the direction of Ben Cooper, and for the first time ever Asian Network Live will be triplecast – broadcast across the BBC’s youth radio stations Asian Network, Radio 1 and 1Xtra. Hosted by the Asian Network DJ family including Tommy Sandhu, the event, which represents the best in Asian music as championed by the station, will see some of the hottest acts on the British-Asian and global music scenes come together on one stage for one night only. Naughty Boy returns to perform new material featuring Kyla and Indian hip-hop superstar Badshah makes an exclusive UK performance, including a new track with Major Lazer-collaborator Anirudh. UK Hip-Hop and Punjabi music producer Steel Banglez will also present some of the most exciting UK artists including MIST and MoStack (both ‘Hot For 2017’ artist tips on 1Xtra), Abra Cadabra and Haile from WSTRN. The event, now in its second year, is open to all ages and promises to be bigger and better in 2017 with more special guests to be announced. Tickets for Asian Network Live will go on full sale on Wednesday 11 January at 8.10am in Tommy Sandhu’s show on BBC Radio Asian Network. For the first time ever, Asian Network Live will be triplecast across Asian Network, Radio 1 and 1Xtra. Asian Network will be covering all of the live build-up from 6pm, followed by the live show from 7.30pm -11pm which will also be broadcast across Radio 1 and 1Xtra, hosted by Asian Network’s Yasser. The show will also be live streamed on Asian Network’s website and BBC iPlayer, with highlights available on Asian Network’s YouTube channel, BBC iPlayer and Red Button. ← Beyonce pregnant with Twins! Bollywood movies to watch this June!